After the break you can find a brief summary of MLP:RiM by the game's creators, and a link to the game itself where you can read the manual, print it off and play it with your friends! 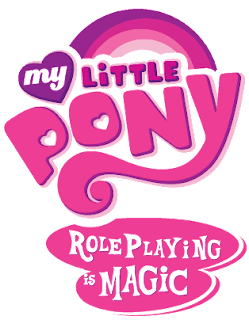 "My Little Pony:Roleplaying is Magic is based on both freeform roleplaying as well as concepts from other pen & paper RPGs which many veteran players will surely recognize. It has elements of World of Darkness, Unisystem, Dungeons & Dragons, Ars Magica, and Mythic, as well as several others in smaller but no less influential ways. The game is very rules-light, and uses interpretation and adaptation, rather then tables and strict rules, to determine not just the outcome of rolls, but the rolls themselves. We believe that it is better described as a "collaborative storytelling system" then as a roleplaying game system. It's not designed for dungeon diving; it's designed for storytelling." Well, that's it for the summary. You can find the game's rulebook at https://docs.google.com/viewer?a=v&pid=explorer&chrome=true&srcid=0B5IFnI6cpZN4YzhiMjBiMDEtMGNlYi00OWRjLThlNjAtNDBkOGEzOTk3NjFj&hl=en_GB, along with a template character card. Now, go out and give it a try!